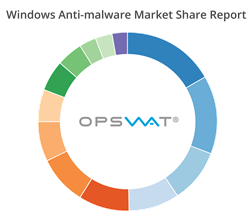 OPSWAT releases first monthly Windows Anti-Malware Market Share Report, covering market share statistics for anti-malware vendors and products. It’s always interesting to see which vendors gain market share since the release of our last report. AVAST is still holding strong at the top, and Malwarebytes has had a significant boost in market share among our users, climbing from 11.6% to 13.17%. OPSWAT today announced the release of their new Windows Anti-malware Market Share Report, a streamlined offering of their past reports that will now be available once a month, providing timely data on market changes. It is important to note that this report is representative of devices running Windows operating systems only. Out of the 61 anti-malware vendors analyzed for this report, the top three by market share are AVAST, Malwarebytes, and McAfee. To see all of the top vendors and their corresponding market share, please view the live report. Along with market share data for the top anti-malware vendors, this report also includes the market share of each vendor’s top anti-malware products, and device type and operating system statistics. For more details on how this data was collected and data disclaimers, please view the full report. The data in this report was generated on October 18th, 2016 and includes data collected in the last 6 months from users of our free tools, including Metadefender Cloud Client. Metadefender Cloud Client is an endpoint forensics tool that scans endpoints and drive boot sectors for malware and vulnerabilities using more than 40 anti-malware and vulnerability engines. The dual purpose of this report is to inspire discussion in the anti-malware community and report on the security practices of our free users. The information in this report is representative of over 40 million data points collected from thousands of live machines. To try Metadefender Cloud Client, please visit https://www.opswat.com/products/metadefender/client. For more information regarding this report, please contact marketing(at)opswat(dot)com. Previous OPSWAT quarterly market share reports are available to view on OPSWAT’s website.